Disclaimer by the Author: This article is presented as information and not a “formal” research paper. However, much time and devotion went into the development of accurate (and hopefully interesting) material. Information is based on numerous sources. Direct references are noted only in case of specific quotes. If you would like the exact reference source for a specific detail, feel free to email us at info@vintagepopupbooks.com. For those of us interested in the historical details of movable books, we owe a great deal to the legacy of G. Löwensohn and his family. Theirs is a complex and memorable story of Triumph and Tragedy – a story that deserves to be told…. The G. Löwensohn company of Fürth was a prolific publisher, printer, and lithographer that operated in Bavaria during the nineteenth and early twentieth century. German chromolithographers, mostly based in Bavaria, came to dominate the trade with their low-cost high-volume quality productions. Löwensohn was the largest and most prolific. The company was founded by Gerson Löwensohn (1817-1871) in 1844 at Star Road 19 in Fürth Bavaria, Germany. He started out as a one man copper plate printer producing pictures sheets, coloring and picture books. He added lithography in 1859. There is evidence, however, from earlier references, that he and his Father Isaac (1777 – 1884) were doing copper plate printings as early as 1838 - before Gerson opened his shop on Star Road. Gerson had 5 brothers and sisters, none of whom were involved in owning the business. Exports were critical to Löwensohn. Their massive growth was largely attributable to exporting. The Löwensohn family prospered. 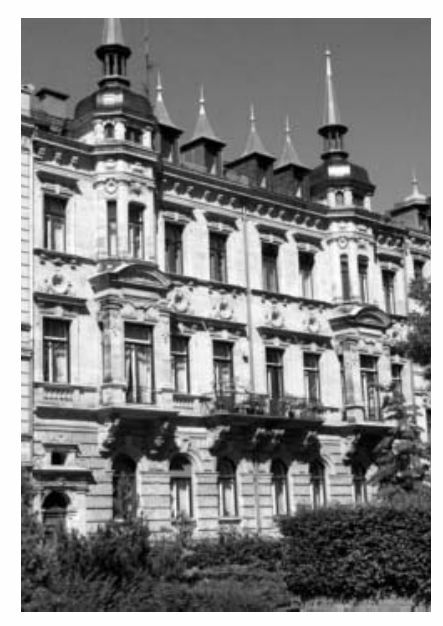 The brothers built mirror image mansions in the Hornschuchpromenade, the main avenue of the upper class in late 19th Century Fürth to show off their wealth and success. The brothers and cousin Albert were well liked, respected, and they treated their workers very well. Löwensohn even set up foundations to financially assist their workers whether they were sick, old, or bereaved. Several foundations were started by the two generous families. These included charitable foundations for infant feeding, for children suffering from tuberculosis, for disabled veterans and their widows and orphans. They donated to the Maternity Hospital, the Municipal Theater, and others. Due to their generosity a street in Fürth was named after them - Löwensohn Fürth-Westvorstadt. In July of 1891 Theodor, on behalf of his wife Rosie, gifted Fürth with “The Forest School and Colony; Waldschule’ in Cadolzburg.” It was for weak and convalescent children. On the flip side, hours at Löwensohn were long- 12 to 14 hours daily except Sundays. There were also inclined to inflict payroll deductions if a worker was late or broke something. Wages in Germany at the time were much lower than wages in the United States. We often talk about American publishers having their work done in Germany because the German print technology and lithographic quality was the best. That may have been true, but we suspect that lower cost was a primary incentive to “print in Bavaria.” In 1908, The Löwensohn lithographers, like other German company lithographers, were paid $5.50 - $8.25 per week, depending on ability. The average weekly pay for lithographers in the United States that same year was $25 per week – or about 340% higher. High quality and low cost, it’s no wonder that so much printing work came out of Germany. While Bernhard had only daughters, younger brother Theodore and his wife Rosie (vee Stockheim) ( 1862-1934) had three children, Gustav Ernst (1883 – 1945), Johanna (1886 - 1934) and Robert (1895 – 1945). Oldest son Gustav served as an interpreter during the First World War 1914- 1918. He entered the family business in 1919 as a third generation owner, eventually joined by his younger brother Robert. Gustav started out as an editor and printer. Like his father and Uncle, Gustav was an exceedingly kind man. He married a beautiful woman named Emmy (nee Mannheimer) who carried on the with the Löwensohn wives tradition of energetic volunteer and social work. For the next 18 years, the company continued to grow under the leadership of Gustov (President), and Robert. As the company prospered so did their families, their workers, and the community of Fürth. It is interesting to note that the brothers had a third partner, Ernst Rosenfeld (1894-1976), who was the only son of Albert who had been a partner and first cousin of their father Theodore’s wife, Rosie. 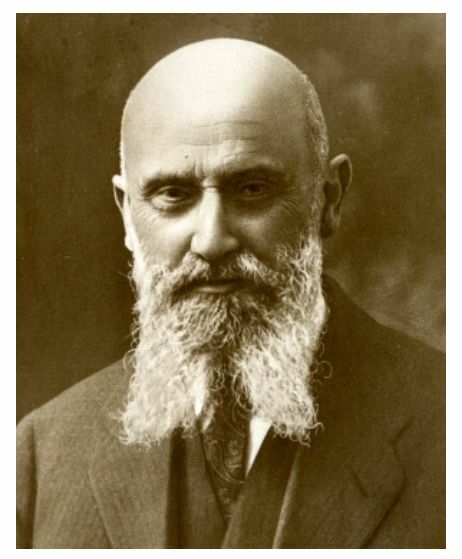 Sadly, the Löwensohn family was forced to sell the company in 1937, two years after Nazi Law prohibited Jews from the being in the printing/publishing business in Germany. 95% of the money derived from the sale of the business went straight to the Nazi state. The centerpiece of the family’s generosity “the Forest School and Colony” was turned into a Nazi Training Camp. In 1937 Gustov fled with his family to The Netherlands and later to Belgium. Unfortunately, In 1943, Gustov was caught by the Nazis and sent to the worst of Hitler’s concentration camps - Auschwitz. While there he was forced to use his foreign language skills to be an interpreter for the commander. He then lost his life there two years later. His brother Robert and wife Ella Ruth (vee Muendheim) (1895 – 1944) had escaped to France with their children but were deported back to Germany to the Buchenwald Concentration Camp where they also perished at the hands of the Nazis. The third partner, Ernst Rosenfeld, survived in exile. Gustov’s wife Emmy and one of their two daughters, Dora (1911 – 1976) survived the war and immigrated to the United States as soon as it was over. The second daughter Lilli (1908 – 1940) was killed in London during “The Blitz” air raids by the Germans. All of Gustav’s descendants are from Dora and live in the United States. Robert and Ella Ruth’s children Anne -Marie (1920-1998) and Gerard (1926 - ?) were not deported back to Germany. They survived and spent the rest of their long lives in France. According to the autobiography of Anne-Marie, posted online in 2002 - Gerhard, as the only male heir, had been destined to take over the firm… had Hitler not intervened. In 1937 the G. Löwensohn family sold the business to Pestalozzi Verlag (PV). PV was founded in 1920 in Nuremberg. In the 1950s and 60s PV become a leading children's book publisher. In 1972 PV production moved from Fürth to Erlangen. This move ended the decades-long tradition of picture-book production in Fürth. PV went on to become the market leader in the field of picture books. They later merged with the corporations VEMAG Publishing and Media AG out of Cologne. In 1998 Pestalozzi Verlag went under the umbrella of - guess who – the huge Danish media company, Egmont. Egmont is one of the leading children’s book companies in the world and the same company that now owns the “Dean & Son” imprint. PV went out of business in 2006, and the Löwensohn archives were sold to a collector in Germany. Today, the old Löwensohn Storybook Factory in Fürth remains on Löwensohn Road. It is being converted into a 31 unit luxury apartment building scheduled to finish renovations by the end of 2014. They promote themselves as “Summer Lofts Fürth - Living in the former picture book factory Löwensohn”. Finding a number on the cover of a Bavarian printed movable book often means a German mass-market edition, and that most often means a Löwensohn. According to Klingberg, books in other countries sold without the participation of a foreign publisher are always undated. This makes them extra difficult to date because we can’t research publisher catalogs. Löwensohn was the printer and sometimes publisher of many movables, including most likely the Moving Picture Books series by The Pictorial Color Book Company. Most of these books were printed for other publishers in various countries and usually did not bear a Löwensohn mark. “Printed in Bavaria” without a printer indicated often means it’s a Löwensohn. One reason that we know that Löwensohn was behind many of these movables because French copies, for whatever reason, often had a small “G. Löwensohn Impr. Fuerth.” When no publisher mark or date appears on printed in Bavaria movables it likely that Löwensohn marketed these books directly from Germany. During and after World War 1 the prejudice of Americans toward Germany required Löwensohn to sell their books to that market without identifying that the books came from Germany. A great example is the “publishing front” Löwensohn set up in New York called The Pictorial Color Book Company. Through PCBC, they were able to successfully sell and distribute The Pictorial Moving Picture Books in America. (We will present further research on the publisher relationships for those books including the publisher George Sully soon.) There are also Moving Picture Books without any publisher information that were likely a first attempt to sell the books on Löwensohn‘s own before the war prior to 1914. Brilliant Gustav could speak several languages. Learning to be multi-lingual undoubtedly arose from his families expansive export business. We have records from the Ellis Island passenger archives that Gustov visited the United States in 1905 at the age of 22 and again in 1909 at the age of 26. It is difficult to find non-French movables published before 1900 that have the Löwensohn imprint. An example of a French Movable with the Löwensohn imprint is an 1890 Capendu title, Le Baron de Montauciel with six movable pages. Another example of a Löwensohn Capendu movable is Grand Théâtre Féerique. 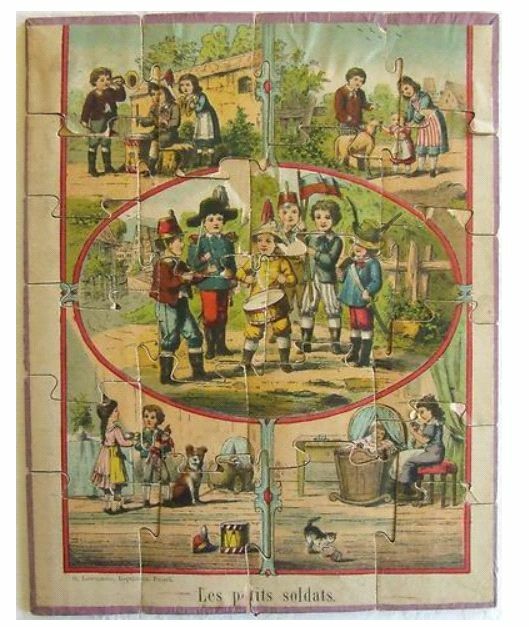 The oldest book reference we could find for a German movable book with a Loewensohn imprint was for Bewegliche Bilder für artige Kinder (Movable Book for Like Children) – 1866. 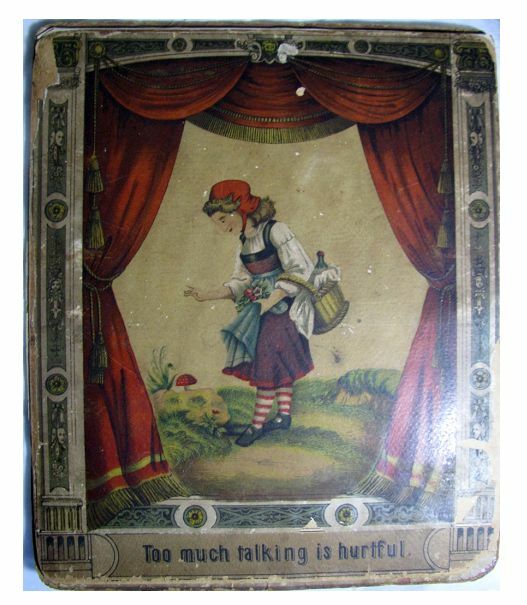 We also Found a movable Lustiges Biderbuch ( Funny Picture Book) – 1871. We have a couple of unusual Löwensohn English titles in our collection. 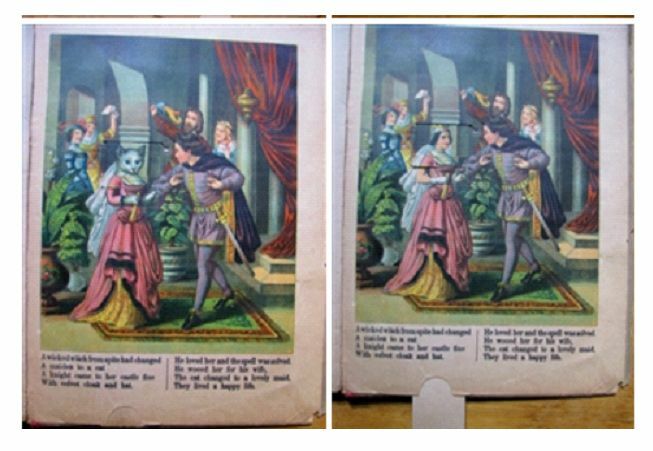 One is an 1883 Löwensohn slot movable entitled, Fairy Tales For Children. 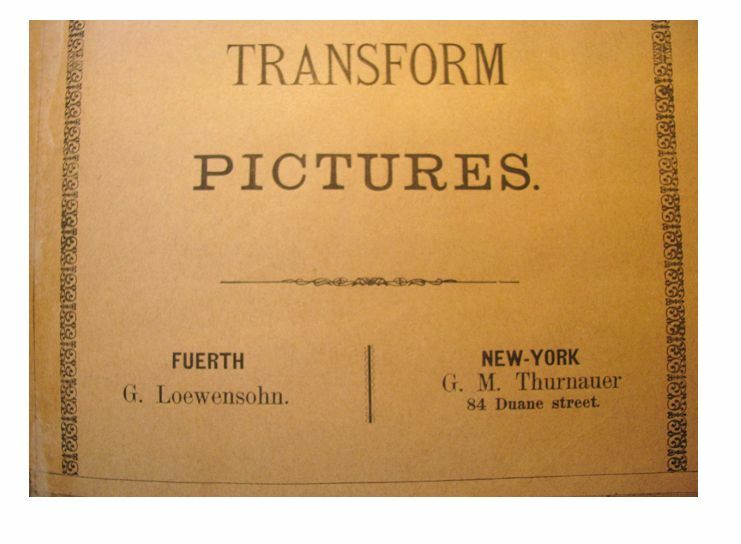 The title page says “Transform Pictures” The tab pulls the slots to reveal a different image within the picture. According to the August 2007 Movable Book Society Newsletter, another series published by Löwensohn was the Theatrical Picture Books published in several languages. They are relatively rare. 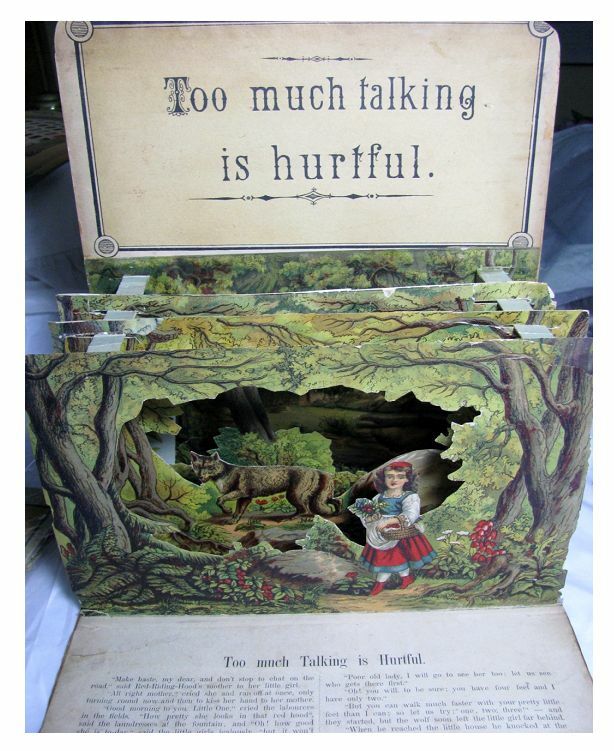 Below are images from our copy of Too Much Talking is Hurtful (Little Red Riding Hood). 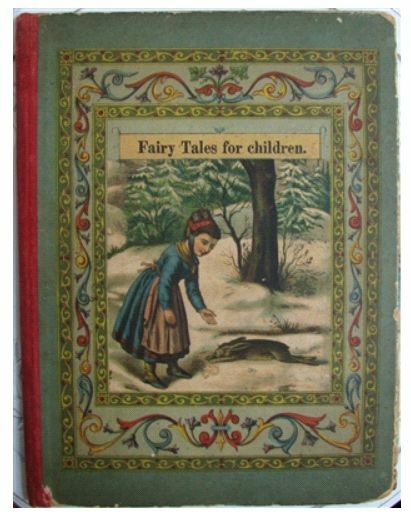 It was published in 1883 along with 3 others, A Rare Cat (Puss in Boots), Awake ( Sleeping Beauty) and Poor Robinson ( Robinson Crusoe). Our English copy has what looks like a Löwensohn imprint, but it is too small and faded for us to read. We also have seen several copies of Löwensohn movables from the 20’s and 30’s in various languages that include books with vovelles as well as pop-up type books where a child can cut out pictures and stand them up. 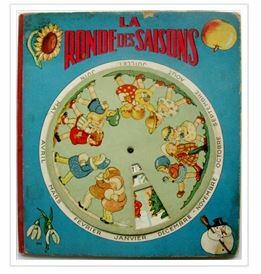 Some of these include The Traffic Light Book ( Vovelle, cut-outs) and The Home Farm and Around The World which include tabbed cut-outs that you can stand up to make scenes, and La Ronde Des Saisons Almanach des tout petits a( book with a turning vovelle cover showing scenes for each month – circa 1920) (shown below). *About the “Quick Press” – The Löwensohn brothers added their quick press in 1876. They were not the first German printer to do so, however. In 1832, Schreiber bought its first letterpress printing machine and in 1864, Ferdinand Schreiber, the older of J.F. Schreiber's two sons, imported the first high-speed lithographic press in Germany from France. Schreiber is best known as Meggendorfer’s publisher. 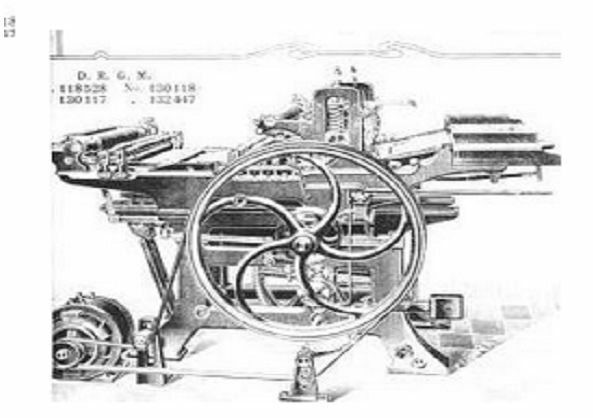 The term quick press was originally used for one type of machine, and eventually all types of flatbed press. We know from an old ad testimonial written by Löwensohn that the company that manufactured at least one of their quick presses was "Steinmesse & Stollberg" and the model was “The Noris”. In the ad, they stated “I hereby like that the machine delivered to me, The " Noris," works to my complete satisfaction and gives rise to no complaints. Fürth i / B, 9 März, 1901. G. Löwensohn. If you would like to find out a lot of details about this press see Google book Allgemeiner Anzeiger für Buchbindereien, Volumes 17-18, pages 473-477. You can also email us at info@vintagepopubbooks.com for the link. Artists - We are still working on a list of artists that worked for Löwensohn. We will update the list on our website as we find them. One prominent one was Paul Otto Engelhard. Many counties had extreme prejudice against anything made in Germany once World War 1 started. Below is a 1914 article, which appeared in the London Standard August 27, 1914, urging people not to buy cards and other printed matter “from our enemies” in evil Germany. Other interesting notes from the article include that 90% of color printing sold in England was printed at the time in Germany and that paper cardboard and goods exported out of Germany in 1913 totaled over 13 million pounds. Monika Berthold Hilpert, Jutta Fleckenstein: Jewish foundations in Fürth. Invitation to a tour. Publisher: Jewish Museum of Franconia Fuerth & Schnaittach. Haigerloch: Media and dialogue, Schubert, 2003, 22 pp. The Paper culture .Creativity with paper page 6 on voith.com (Schreiber).